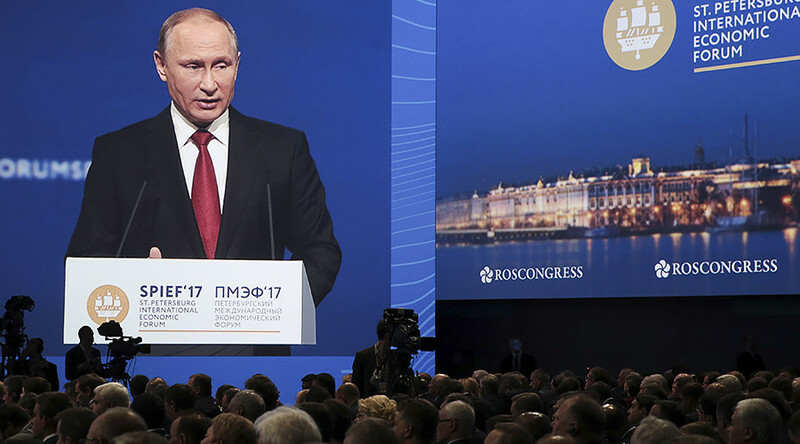 Russian President Vladimir Putin has largely resorted to irony at the St. Petersburg International Economic Forum (SPIEF) as reporters seemingly failed to come up with new questions, focusing on Moscow’s alleged meddling in the US elections, and Donald Trump. There have been no secret agreements between the Russian ambassador to the US, Sergey Kislyak and the Trump administration, Putin said at Friday’s Q&A session in St. Petersburg. "My answer is – no!... No talks had even started," the president told the forum, adding that he was surprised with all the fuss surrounding the work of the Russian diplomat in the US and calling anti-Moscow allegations "delirious." "It's not even clear where all the people spreading such information come from... So, the ambassador meets someone. And what is an ambassador supposed to do? It's his job, he's being paid for that. He must be meeting people, discussing pending issues, making agreements. What else is he supposed to do there? Visit some venues that would then see him fired?" Putin wondered. The panic surrounding some of Trump’s decisions is blown way out of proportion, Putin noted at the forum. Commenting on the US president’s decision to pull out of the Paris Climate Agreement, the Russian leader joked that now any weather-related issues can be blamed on "American imperialism." "By the way, we should be thankful to President Trump. I've heard it has been snowing in Moscow today, and here it's raining, and terribly cold. Now we can blame it all on him and on American imperialism, hold them accountable," Putin said. "But we will not do that," he added, smiling. Noting that the decision on the Paris climate deal had been taken by another US president, Barack Obama, Putin said that the new administration would probably just rework the agreements, or come up with a new climate deal. "[Trump] is not refusing to work on the issue, as far as I know... The [Paris] agreement will come into effect in 2021. So we still have time, and if we all work constructively, we can agree on something," the Russian leader said, then switched to English and added tunefully: "Don't worry, be happy." 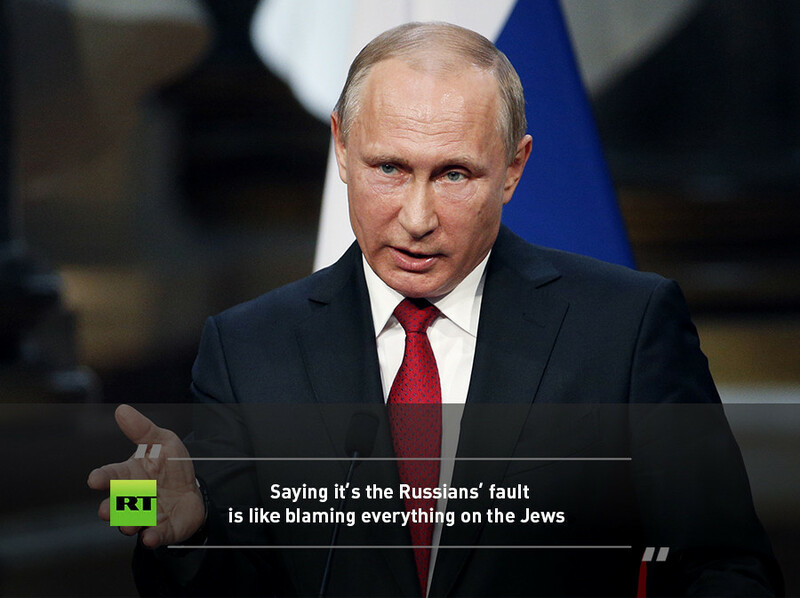 Those who accuse Moscow of the defeat of the US Democratic Party in last year's elections behave like those who blame the Jews for everything, the Russian president said. "It's easier to say that it's not our [US Democrats'] fault, but Russians' fault, say that they interfered with the elections... It reminds me of anti-Semitism, when everything is Jews' fault. Someone is a mutt, can't do a thing, but the Jews are to be blamed. 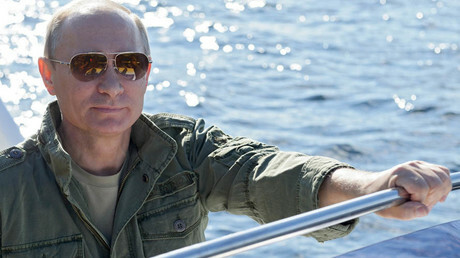 But we know where such an attitude leads to, it never ends well," Putin said. 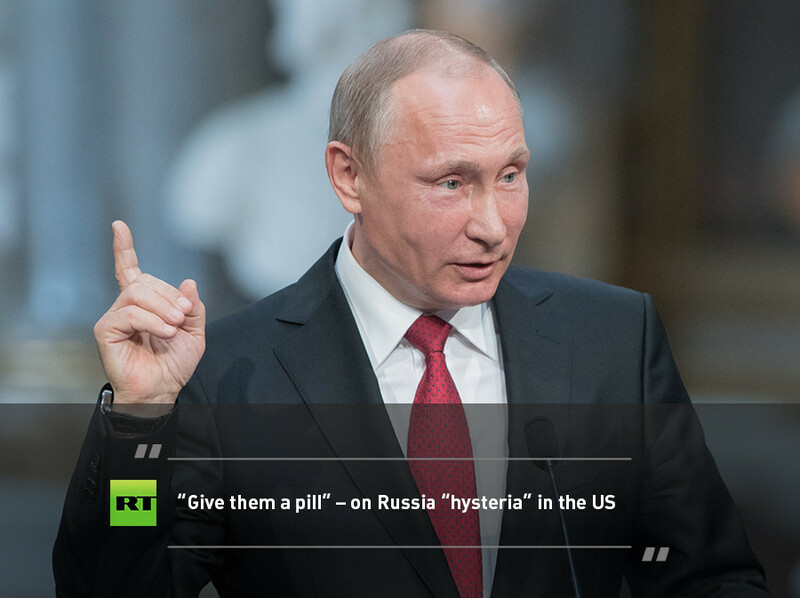 Once again asked to comment on the situation surrounding Russian diplomats in the US, who allegedly tried to tempt some Trump people into favoring Russia, Putin reacted quite emotionally, saying he was tired of the "hysteria" which the US "fails to cease." "Should you be given some pill? Does anyone have a pill? Give [them] a pill! Seriously now," the Russian president said. The Russian president also called on the West to stop meddling in Russia's domestic policies. "Look at your colleagues, what they are doing here," Putin told NBC journalist Megyn Kelly, who was asking questions at the forum. "They are all over our domestic policy, they're sitting on our head, dangling their feet and chewing a bubble gum. Entertaining themselves. It's a systematic, rude and absolutely unceremonious interference in our domestic policies that lasts for many years, also at a diplomatic level," he said. Having called NATO "an instrument of US foreign policy," the Russian president said that the lack of "constructive dialogue" with the military alliance impedes joint efforts on fighting terrorism. Having wondered what is the purpose of the alliance if both the Soviet Union and the Warsaw Pact are no more, the president said that the failed dialogue with NATO is not Russia's fault. 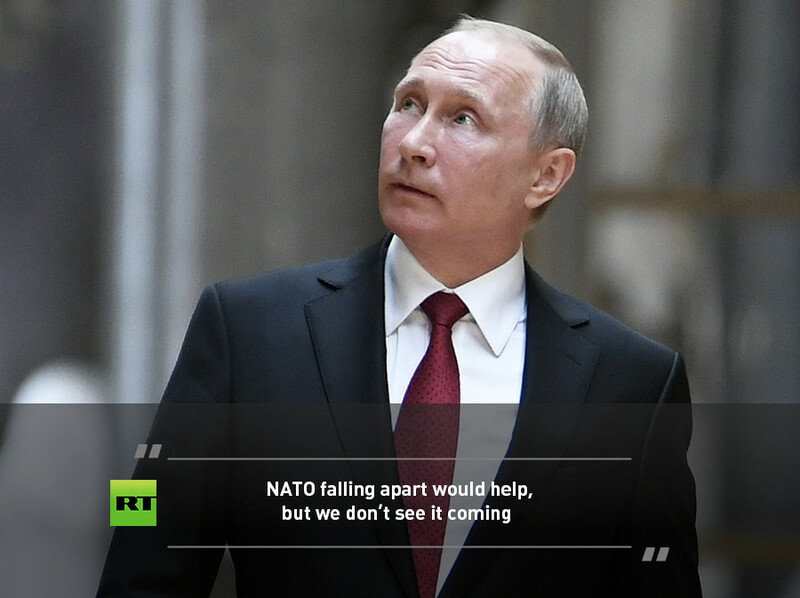 Asked to comment on reported disagreements within the alliance, Putin commented, with irony: "Well, if you suggest that NATO could fall apart, then these [disagreements] would help us. But so far we don't see it coming." Commenting on the Syrian issue, the Russian president said that the conflict in the Middle East should "in no way be used as means to sort out [someone's] pressing political issues." "And we sometimes see such attempts [in Syria]," Putin said, explaining that forces within the country are being used by other foreign parties to fight Assad. "You use them today, and never know what happens to you tomorrow. They might be fighting you... So, Al-Qaeda was at some point created to fight against the Soviet Union in Afghanistan, and then Al-Qaeda hit the US on September 11," Putin pointed out. The Syrian President, Bashar Assad, "might have made mistakes," but the groups he’s fighting within the country "are no angels either," Putin said, adding that the latest chemical attack in Syria was a provocation against the government. "Regarding the people who were killed and suffered from weapons, including chemical weapons – this information is false. As of today, we are totally convinced that it was just a provocation. Assad did not use that weapon. 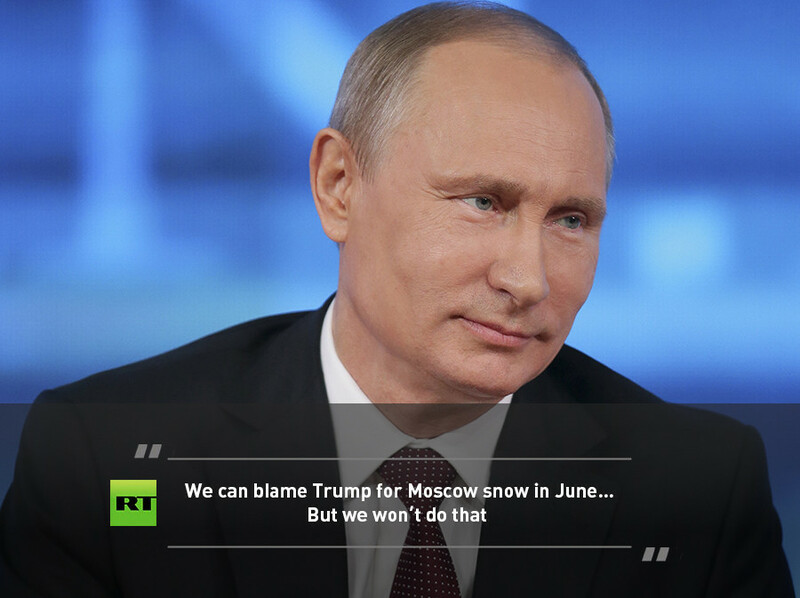 It was all done by the people who wanted to blame him for it," Putin said.